If you or a family member are one of the six million Americans who experience severe, sometimes life-threatening allergic reactions (or anaphylaxis), you're probably already used to avoiding allergens and carrying around an EpiPen in case of emergencies. However, there's a new kind of epinephrine auto-injector called Auvi-Q which is designed to make dealing with an allergic reaction easier -- with the help of tech. 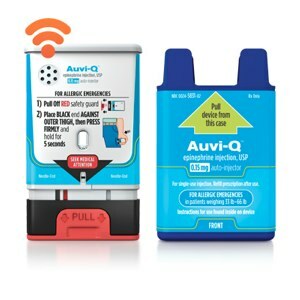 The Auvi-Q isn't just an auto-injector: the device features audio instructions on its use that walk you through what to do as soon as you've taken it out of its case, so that there's no chance of making a mistake when you need to use it. And in a stressful situation, those clear instructions might make all the difference. Additionally, Auvi-Q administers epinephrine more quickly than a standard auto-injector (and it tells you when it's finished) and it keeps the needle retracted unless it's being used, so there's no risk of accidental needle sticks. And for iPhone users, there's an Auvi-Q app that will let you practice using the device, let you set up allergy profiles, and send messages to emergency contacts you've set up. All of that adds up to an emergency situation that would be a lot easier to deal with.